Over millions of years, evolution has enabled fish to quickly and easily move through the aquatic environments that they call home. Such environments, as we’ve previously noted on the blog, pose challenges for manmade vehicles and robots, as murky waters and lack of light make them difficult to navigate. To address these issues, fish are often used as a source of inspiration in the development of aquatic designs. Exploring the swimming patterns of fish helps to optimize the design of aquatic technology. Image by Jim and Becca Wicks — Snap of Snapper!. Licensed under CC BY 2.0, via Wikimedia Commons. 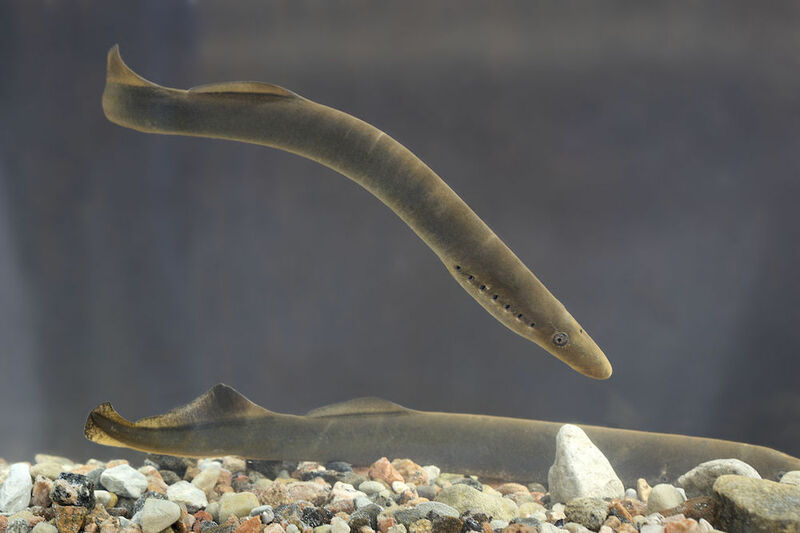 Researchers at Cornell, for instance, are developing a soft robot that is designed to swim like a lamprey fish (shown below). The fish-inspired robot uses the simple structure of a lamprey to offer the potential for self-sustaining space exploration, particularly in the oceans of Jupiter’s moon, Europa. A lamprey is one type of fish whose behavior is inspiring the development of aquatic robots. Image by Tiit Hunt — Own work. Licensed under CC BY-SA 3.0, via Wikimedia Commons. To build these robots, researchers need to learn how fish move in their aquatic environments. They can do so with FSI studies that account for fluid velocity, pressure, and the stresses and strains on the fish. 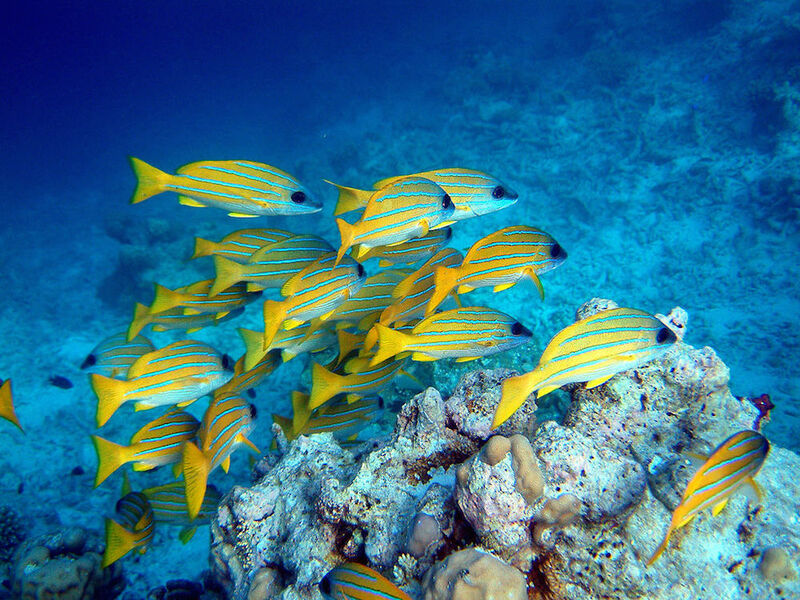 By looking at the effects of the fluid environment on the movement of the fish, and vice versa, researchers can obtain accurate and useful results. Today, we’ll explore how a team from the Università Roma Tre used the FSI simulation capabilities of COMSOL Multiphysics to investigate fish locomotion, which is outlined in their paper “The Virtual Aquarium: Simulations of Fish Swimming“. They presented their research at the COMSOL Conference 2015 Grenoble, earning a Best Paper award and the popular choice Best Poster award at the event. For their analysis, the researchers used a 2D approach to evaluate the movement of a fish swimming freely in a fluid domain. They simulated the interaction between the fish body (the solid) and the surrounding salt water (the fluid). They also simulated the fish’s muscle contractions using the notion of distortions. Here, we’ll look at the FSI techniques that they applied to their research. The simulation study focused on carangiform swimming, a category of fish body movement in which a fish’s muscles contract from head to tail in a wavelike pattern. As the animation below illustrates, the movement causes the tail to function as a propeller and produce a localized thrust wake and momentum jet. This results in a force that propels the fish forward. The carangiform swimming pattern of a fish. In their simulation studies, the research team sought to analyze carangiform swimming for different periods of time. However, when the fish moved inside of the virtual aquarium, it deformed the surrounding mesh, as indicated below. The movement eventually produced such a large deformation that an automatic remeshing method was required. With the Fluid-Structure Interaction interface, the researchers were able to solve the problem by applying a moving mesh technique for short periods of time and a remeshing technique for longer intervals of time. Meshes used to analyze the fish’s swimming patterns. Images by M. Curatolo and L. Teresi and taken from their COMSOL Conference 2015 Grenoble presentation. The meshing techniques mentioned above allowed the team to accurately study the effects of fish motion on the fluid environment, including wake creation. When a solid such as a fish moves in a fluid environment, it can create a wake, or an area of disturbed flow, behind itself. 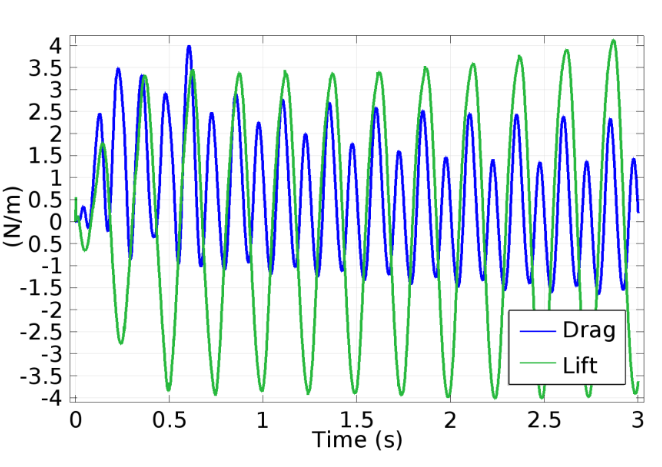 The research team used COMSOL Multiphysics in this case to observe and analyze the wake pattern and vortices generated by carangiform swimming. They found that every stroke of the fish’s tail released vortices and that the mutual distance between the cores of the vortices didn’t change. Vortices and a wake appear as the fish starts to swim. Image by M. Curatolo and L. Teresi and taken from their COMSOL Conference 2015 Grenoble presentation. The pattern of the vortices and the wake. To further understand how the surrounding salt water and fish body interact with one another, the researchers also computed the lift and drag. The results showed strong similarities between the tail velocity components and the lift and drag forces. 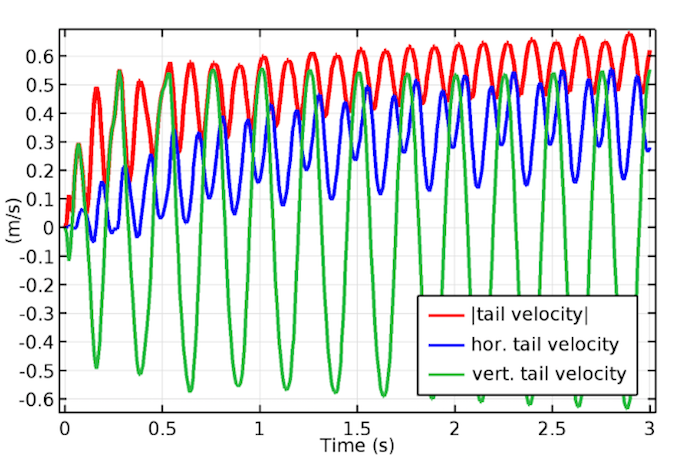 Left: A plot comparing tail velocity forces. Right: A plot comparing the lift and drag. Images by M. Curatolo and L. Teresi and taken from their COMSOL Conference 2015 Grenoble presentation. When comparing the model results to actual measurements, the team of researchers found satisfactory agreement between the two cases. They hope that their simulation results will inspire future advancements in the study of fish locomotion. Simulating swimming fish is just one example of a complex problem that can be addressed with the FSI capabilities of COMSOL Multiphysics. Such tools enable you to simulate a variety of elements, from mixers and pipe flow to vibrating structures in fluids and poroelastic media. Interested in learning about the other types of FSI problems you can solve in COMSOL Multiphysics? 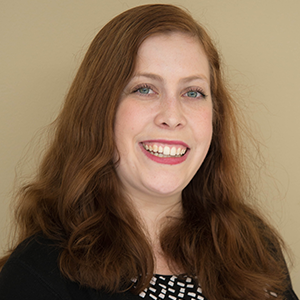 Be sure to check out this blog post, which offers a helpful overview. We also encourage you to watch our archived webinar on FSI simulation, as well as download one of the fluid-structure interaction tutorial models, including this example, from the Application Gallery. Editor’s note: The corresponding fish swimming model file and a related model file were added to the Model Exchange on 2/21/2017. You can find them here. This is an excellent FSI example. This is a very interesting topic. I have a question. From what I read, motion of the fish body is prescribed and this in turn induces the hydrodynamics of the surrounding water, which induces stress on the fish body. In the case where the stresses in the fish is of no interest, would the FSI still be relevant in such a case? Would it be easier to solve the problem defined by the NS equations and the moving mesh module? Pressure fields will then be computed as a result.